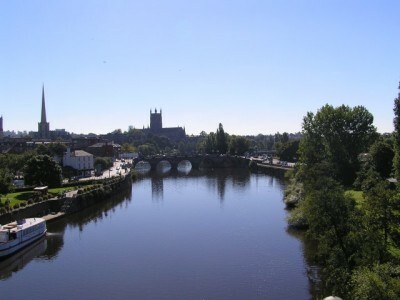 The Chronicle of John of Worcester is the only source that records the attack on Worcester in 1139, by Miles of Gloucester, who rebelled against King Stephen earlier that year. In retaliation, Waleran, count of Meulan, sacked Sudelely. One morning at the outset of winter, on Tuesday, 7 November, we were engaged in divine service in the church, and had already chanted prime, when behold a large and strong army which we had expected for many days, approached from the south, arriving from the source of all evil. The city of Gloucester had prepared arms and advanced with an enormous force, both on horse and on foot, to assault, lay waste, and set fire to Worcester. Fearful for the sanctuary’s treasures, we put on our albs, and, while the bells tolled, carried the relics of our most blessed patron Oswald outside in suppliant procession, and, as the enemy rushed from one gate to another, we bore them to the cemetery. The enemy gathered together in one body and rushed at first to attack a strongpoint in the southern part of the city near the castle. Our men resisted bravely and manfully. The enemy was repulsed here, and as beacons were lit on the northern side of the city, they sought to break through there. There were no defences on that side, and a mass of raging and uncontrolled enemy forces broke through, and set fires to houses in various places. Alas, no small part of the city was burnt down, though the greater part survived unburnt. An enormous booty of chattels from the city; and of oxen, sheep, beasts, and horses from the countryside is carried off. Many are taken prisoner in the streets and in the townships, and led away, coupled like dogs, into wretched captivity, Whether they have the means or not, they are forced to promise on oath to pay whatever ransom the mouthpiece of their captors cruelly fixed. These things, certainly greatly oppressive to the wretched sufferers, happened on the first day of winter. Now the booty is taken away, numerous houses consumed by fire, the rabid and debauched force retreats, never to return on so degraded an enterprise. On the thirtieth day of November, the earl of the city came to Worcester. Waleran grieved as he saw the firing of the city, and felt as if the damage had been done to himself. Intent on vengeance, he went to Sudeley with a force of soldiers, for he had heard that John fitz Harold had deserted the king and attached himself to the earl of Gloucester. If you ask what the earl did there, the answer is barely worthy of record for he rendered evil for evil. He seized and carried off a booty of men with their goods and cattle, and returned to Worcester the next day. This item is under copyright of Oxford University Press (OUP), 1998, and is used here only by permission of Oxford University Press. The OUP Material may be down-loaded and printed out in single copies for individual use only. Making multiple copies of any OUP Material without permission is prohibited. This entry was posted in Primary Sources and tagged 12C, England, sieges. Bookmark the permalink.